Not many posts by me lately, but it's not for lack of productivity. 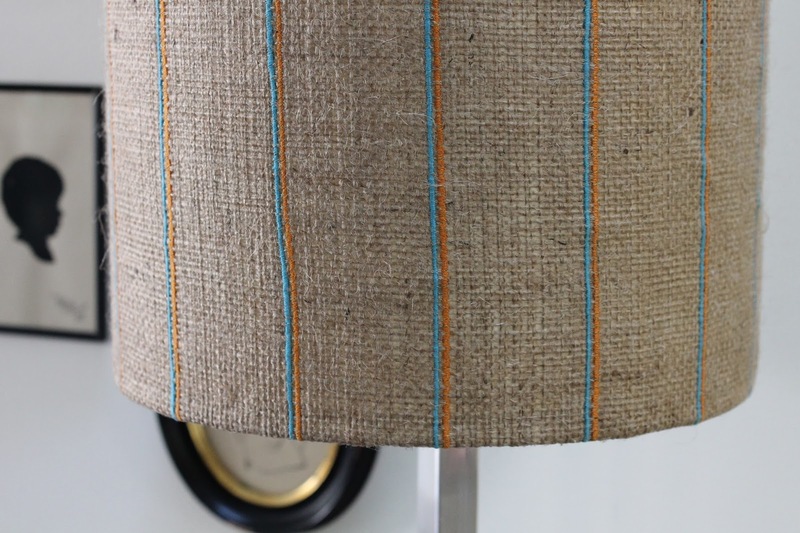 At the end of Thanksgiving break, I was able to steal away enough time recover this shade in burlap that I striped myself. The shade that I recovered was looking pretty nasty. 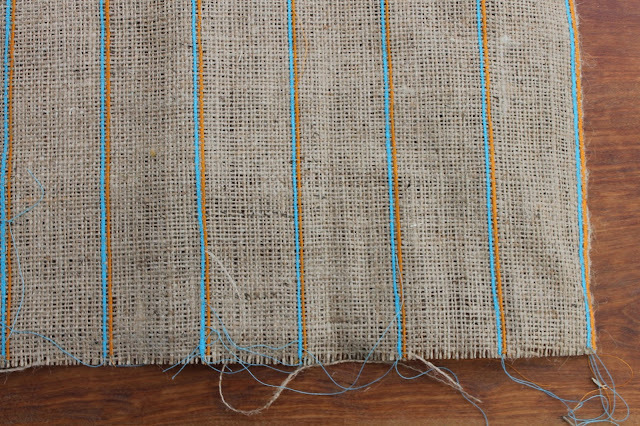 The white linen is glued to a hardish substrate, which I left alone because I thought that the fabric would make a good gluing surface for the burlap. I removed the edging because I wanted to get rid of the bulk there. I used the same basic no-frills burlap that I used for the shades in my bathroom. 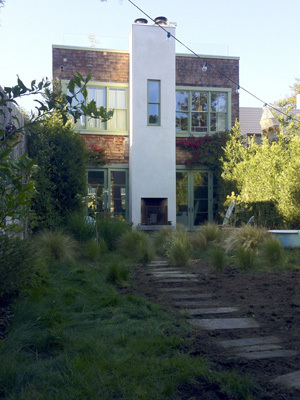 Remodelista did a nice story about that here. I chalked lines two inches apart for the stripes, sewed all the orange lines first and then added the blue ones second. 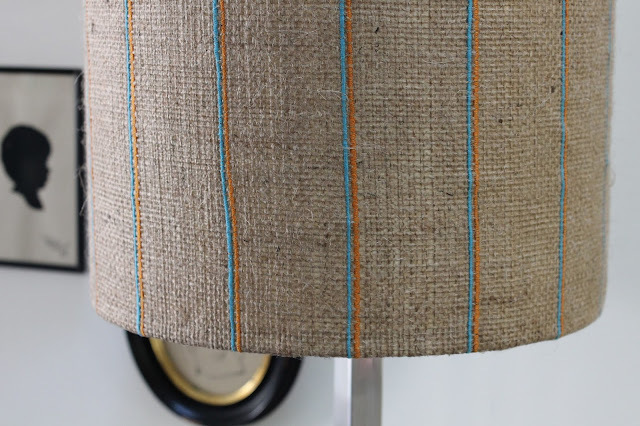 There are endless cute color combo and striping possibilities that could be done here, all looking fab against the burlap. I made the stripes using basic all-purpose polyester Gutermann thread on a very tight zigzag setting on my sewing machine. I did what is called a "dry glue-up" in woodworking terms first. That is I made sure that everything aligned properly and that my system of clothespins was going to work before slapping on any glue. For glue I used Bish's Tear Mender, which sets up very fast and is very easy to work with -I just brushed mine on with a disposable brush. In the real glue-up I left no space between the clothespins, so that I was sure to get that seam to lie very tight and flat. Initially I thought that I was going to treat the edges in the same way as the original (with a ribbon of fabric), but found a cleaner way to go about it in the end. I sewed two blue stripes along the fabrics edge: the outside one to prevent fraying, the second to add a slight decorative detail and make the fold-over look purposeful and neat. I am very happy with this project. It was very fast, satisfying and easy to do and I think this shade looks unique and much much better than the drab white one that is hiding under there.